Elements Applied: The remedy is dried and produced into tablets. Used For: The remedy is known to relieve inflammations, treat fevers, and bacterial infections. It is also beneficial for fever cases associated with convulsions and delirium. It may additionally be applied for recurrent sore throats and ruptured internal abscesses. Additional Info: The remedy is a highly expensive medicine and is mainly added to Chinese remedy named Niu Huang Jie Du Pian. The mixture of water buffalo horn or rhinoceros with niu huang may be extremely useful in case of encephalitis, meningitis, and Legionnaire’s condition. Preparation and Intake: The commonly used dose is from 0.15 to 0.3 grams. 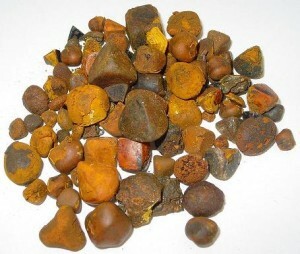 Safety: Cow bezoar is not recommended for use during pregnancy, and in case of stomach or spleen deficiency.